Before the 1920 Presidential election, perennial candidate William Jennings Bryan announced he did not desire the Democratic Presidential nomination. But, as a three-time party nominee with two additional attempts seeking his party’s nomination, his announcement was received with skepticism. 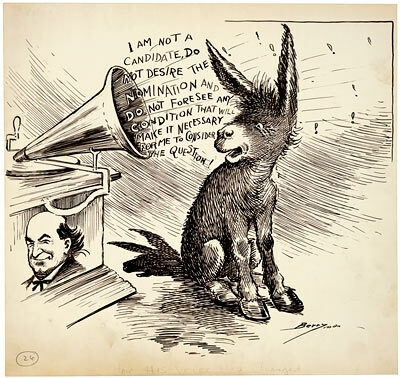 An old-fashioned record player, known as a Victrola, spreads his message. The Democrats nominated James M. Cox, Governor of Ohio, who lost the Presidential election to Republican Warren G. Harding.